Brioche is a very classic bread, and on the rich end of the spectrum, with eggs and butter playing important roles. With an egg-washed top that provides a shiny mahogany color, this bread screams "decadent." Or maybe it screams "use me for French toast." This recipe from The Fundamental Techniques of Classic Bread Baking doesn't reveal any major baking secrets, but I've got to say that beating on butter with a rolling pin can be kind of fun. I got a review copy of the book from the publisher (Stewart, Tabori & Chang) and this recipe was used in my Knead the Book column on Serious Eats. I hadn't planned on using more than one of those recipes here, and I already published the Kaiser Roll recipe, but this was too good not to share. One thing to keep in mind with this bread: it will be rather dense before the butter is added. It gets much softer after the butter is incorporated, so don't be tempted to add more water to the first mix. 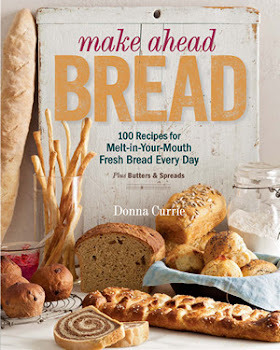 Like other recipes in this book, there are a lot of steps, but none of the steps are difficult. While you could knead this by hand, I'd really recommend using a stand mixer. Trying to get that butter incorporated in the dough by hand would be ... interesting. Prepare the mise en place, taking care that the water and the milk are about 75 degrees. Place the butter on a clean, flat work surface and, using a rolling pin, lightly pound on it to soften. Combine the bread flour, water, milk, eggs, and yeast in the bowl of a standing electric mixer fitted with the hook. Mix on low speed for about 5 minutes, or until the dough is starting to become shaggy (mixed but not smooth in texture) and there is some gluten development. Add the sugar and salt, increase the mixer speed to medium, and continue mixing for about 5 minutes, or until the dough begins to come together into a mass. With the mixer on low, add the butter, a little at a time, and mix for about 5 minutes, or until the dough has come together and pulls away from the bowl. Lightly oil a large bowl or container. Scrape the dough into the prepared bowl. Cover the bowl with plastic film and set aside to ferment for 45 minutes. Uncover the bowl and fold the dough. Again, cover with plastic film and set aside to ferment for 45 minutes. Uncover the dough and divide it into three 450 gram / 16-ounce rounds on the floured surface. Cover with plastic film and bench rest for 15 minutes. Lightly butter three 9-inch loaf pans. To make the egg wash, combine the egg with 14 grams / 1 tablespoon water in a small bowl, whisking it to blend. Uncover the dough and, if necessary, lightly flour the work surface. Gently press on the dough to degas and carefully shape each round into a batard. Place a batard, seam side down, in each prepared pan. Using a pastry brush, lightly coat the top of each loaf with the egg wash. (Do not discard the remaining egg wash.) Cover the loaves with plastic film and proof for 2 hours. About a half hour before you are ready to bake, preheat the oven to 350 degrees. Transfer the loaves to the preheated oven. Bale for 35 minutes or until the crust is golden brown and shiny and the sides are firm to the touch. This recipe is part of a progressive dinner. Follow #SundaySupper on Twitter to see what we're up to, and check out all the other participants in the blog hop!